I am back from Tennessee! I had a wonderful time visiting with my cousin and her husband and seeing our mothers’ cousin as well. It didn’t rain there nearly as much as it was in California, I am happy to report! I returned last night to rain and mud everywhere, flooded roads, and what not. Gosh, I leave for a few days and it all goes to heck in a hand basket! While in Memphis, I had two BBQ pulled pork sandwich meals with all the fixings, a fried chicken meal, a pimento cheese sandwich, lemon ice box pie, fudge pie, and a fried peach pie. That was all eaten out. Also, my cousin in law fixed a delicious meal one night of baked BBQ chicken and a pancake and bacon breakfast one morning. By Thursday night, all three of us were basically ready to go on a lettuce and water fast to recover from all the good food! There is nothing like southern food, at least in my mind. But, then, I grew up eating that kind of food, so southern food means good home cooking to me. I hope everything has been going well in your neck of the woods these last few days. We have a day off from the rain and then it is coming back again tomorrow, or so the weather people tell us. Oh boy! 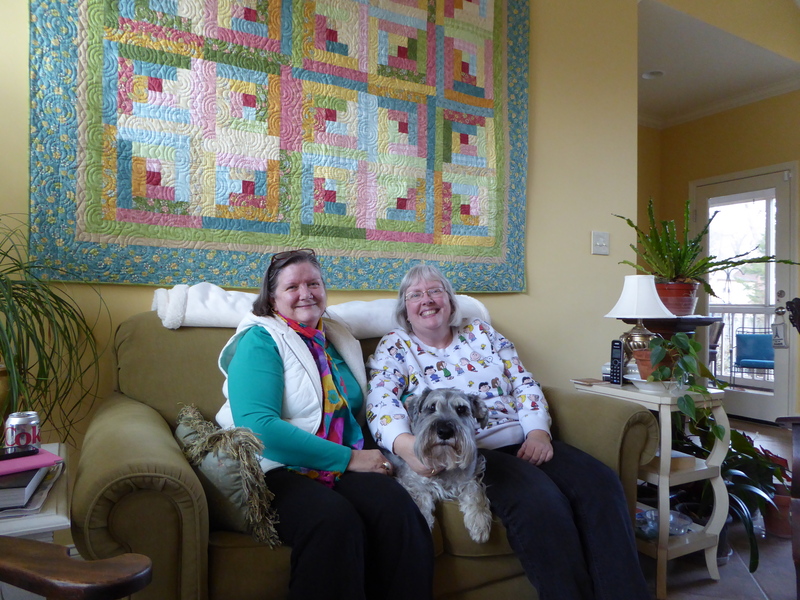 My Cousin Linda and me, with Jack, her sweet puppy dog. Linda made that beautiful quilt on the wall behind us. The South has the best fried chicken! !